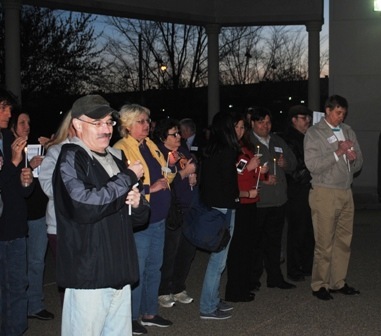 Some 80 labor and civil rights activists, together with a few elected officials, gathered at dusk at the Beaver County Courthouse April 4 for a candlelight vigil. 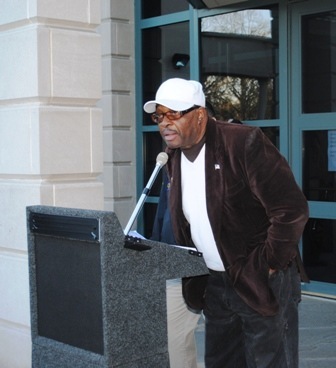 The somber but militant event commemorated the anniversary of the assassination of Dr. Martin Luther King, Jr. and protested the current efforts of rightwing PA Republicans to block citizens from voting in 2012. Alford repeated the refrain several times as he introduced new speakers. 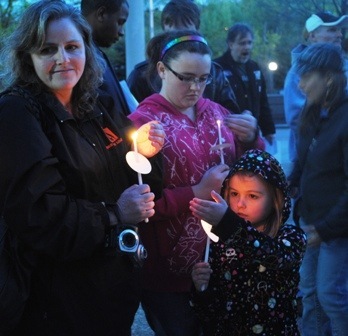 The vigil was sponsored by the Beaver-Lawrence Central Labor Council, SEIU Local 668, the USW, and the Beaver County NAACP. The 12 CD Progressive Democrats of America also endorsed the vigil, and turned out a good-sized contingent. The target of everyone’s anger was the passage into law of HB 934 last month, the so-called ‘Voter ID Law’. “We plan to challenge this as a new version of the unconstitutional ‘poll tax,'” explained a representative of the American Civil Liberties Union to the crowd. 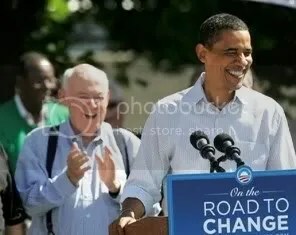 “They claim that a state driver’s license or state ID is free. But since the new homeland security rules, you have to have a legal copy of your birth certificate. Many people don’t have one, and there is a charge for getting one, and you have to appear personally, also a cost. Beaver County Register of Wills and Democratic State Committee member Carol Fiorucci announced that the Pennsylvania Democratic Party will also file suit against the voter restriction law. 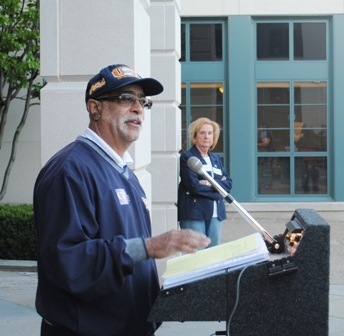 Mike Scarver, International PAC Coordinator of the United Steel Workers, tore into the entire nationwide GOP effort as anti-union and anti-worker. Other speakers included Congressman Mark Critz, Willy Sallis, President of Beaver County NAACP, and Kathy Jellison, President of SEIU Local 668. Kim Villella, a Baden resident running for State Senator against Republican Senator Elder Vogel, who voted for the bill, spoke about the difficulties nursing home residents will have with this new voting restriction. “Something has to change,” said Rev. Kevin Lee, also an IBEW member. “We have to find a way to mobilize the energies of a new generation.” As everyone was lighting candles, the NAACP’s Mtume Imani followed by recalling her own experiences at the 1963 March on Washington for Jobs and Freedom,’ then led everyone in singing the civil rights anthem, ‘Ain’t Going to Let Nobody Turn Us Around.” It captured the spirit of the gathering as it dispersed, newly informed and energized. Eric Hoover, Vice-President of the Beaver-Lawrence Central Labor Council, closed the program by reminding everyone of the importance of standing together. The Republicans fixed there last two elections. Now there desperately trying for a third.